issued by the crypto active superintendence, created on 04/09/2018 for cryptocurrency exchange offices. offices around the date of the previous proposal (https://www.dashcentral.org/p/Cryptolifex ). that allows the legal operation in the country. Below we attach for your review and certification said contract. with certain documents that are part of the requisites required by the cryptocurrency superintendence. Demonstration of the operating platform in Livenet at the 6th Dash Venezuela Conference. The platform has been operational for two consecutive months in the testnet for all public without any inconvenience. Over 122 people registered during that period. Over 500 visits by different users during the last two weeks without any kind of advertising. it keeps on progressively strengthening the consecution of its objectives. This time around, it introduces its plan for the year 2019. ﻿From its planning, CyptoLifex takes on the challenge to become the first licensed peer to peer exchange house in Venezuela. Investing in paperwork in a communist economy does not make sense to me. Better to do things on the black market. 1) ask includes, office rent for a year!! 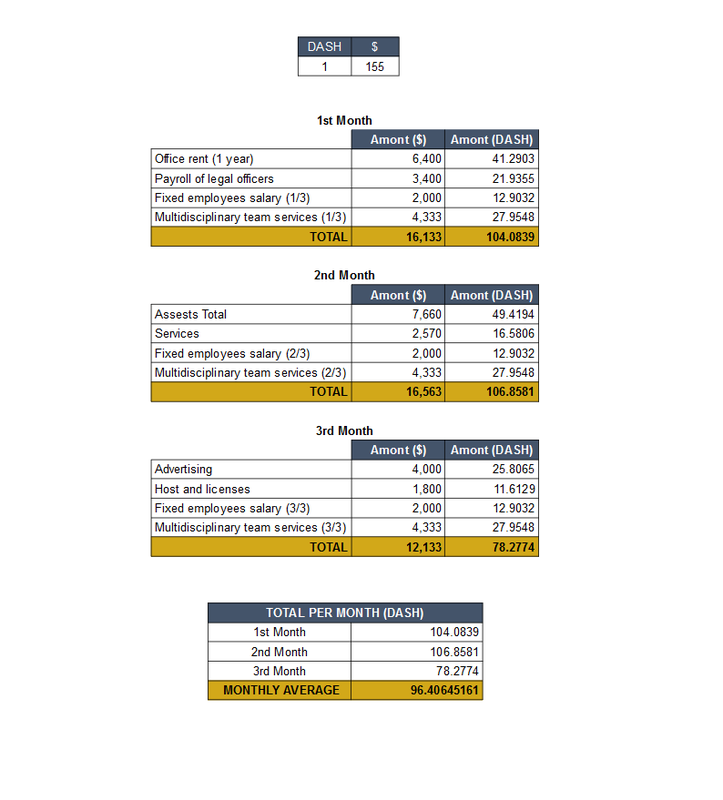 2) ask includes employee salaries for an undetermined time. 4) Venezuelans cant afford to invest in their own exchange, how will you have any meaningful volume? 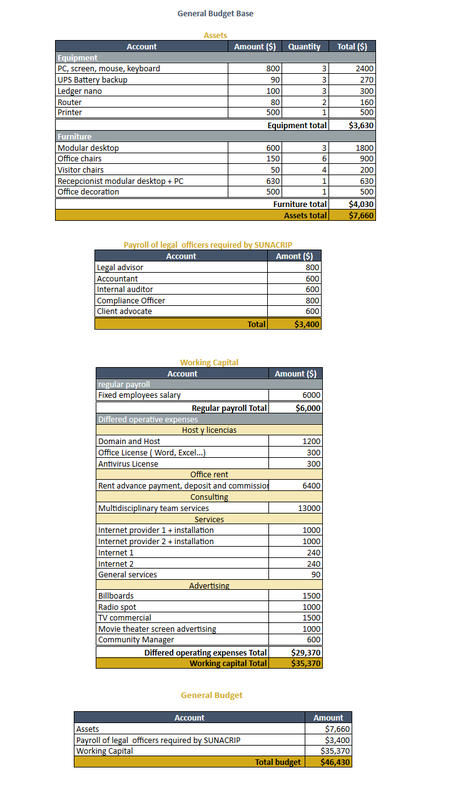 6) you would like to launch into other countries with little to no experience or cash flow. 7) your proposal does not provide a complete business proposal picture rather just a set of asks. 8) proposal has several employee related asks but maintains a high level of ambiguous answers. This post is literally the same post as that of Realmrhack from 2 days ago. Pls confirm you are not the same masternode owner as Realmrhack, and that you are not using multiple Dash Central accounts to influence the upvote and/or downvote of proposals and comments. But he has raised some valid points and the MNO community deserves to be aware of the SCAM this proposal is! @qwizzie it is definitely not me. 1)In Venezuela, especially in Caracas, the majority of the contracts to rent offices are like this: 1 year in advance, 3 months deposit and 1 month of fee for the person in charge. 2)Given that it is a sustainable business model, the first days without license will not generate any income, that's why we are requesting an amount of salary to pay the employees for the stipulated time of the license acquisition. 3) We do not understand your concern. It is good to know that we have inverted more capital in this project that what you think. Just at the beginning of the first proposal, we had lost 60% approximately of the budget requested. 4)There are no Venezuelan exchanges with license between Dash and VES. All the people wanting to exchange their Dash for VES and viceversa will use our platform. With good publicity and operating legally we can achieve a significative volume. 5)It is good that there are those payment methods, but what’s wrong to create a new one that will not be financed by the DAO? 6) That is in our future plans but our first priority is to serve the Venezuelan people. 8)We are trying to express ourselves as clear as possible, would be great if you point out what you are not understanding. It's not clear to me, do you have the license already? If not, what do you think your chances of getting the license are? No, we do not have the license yet but to this date, there are 6 exchange sites with license already. Taking those success examples into the equation and adding our multidisciplinary team we can say that our chances of getting the authorization to operate are very high. 1) A few of the comments have indicated here that from the date of launch, Cryptolifex will offer 12 months of exclusivity to Dash. Can you please confirm that you will not add any other cryptocurrencies during this period? I am curious about your position on Petro, which will presumably live at the time of your launch. Are you in any discussions to include Petro, before or after the 12 month exclusivity period? 2) Who are the other investors in this project, who will ultimately own equity in the project? Is the Venezuelan government, or any organisations or people associated with the Venezuelan government, involved in any way other than as the regulator? A.1) We confirm that we will not add other cryptocurrencies during the commitment time. We already talked about adding Petro after the year (DASH exclusivity period), only the PETRO-VES / VES-PETRO pair. Say that we were not going to add the petro would lower our chances of getting the license. A.2) Currently we do not have an investor. We are the only owners of our project. neither the Venezuelan government nor people associated with it are linked to the project. I want the DAO to spend money improving Dash in Venezuela. I don't want the DAO providing Seed Funding for unproven startups. Voting No. Create a DAO specifically for this venture and you'll probably find some MNO interested in becoming shareholders. We get one year of exclusivity which will be over during the crawling phase of this proposal and they will do exactly what anypay has done which is support other currencies. Adoption is growing at an exponential rate in Venezuela, and we have all the reason to be excited over it! "CyptoLifex keeps its commitment of offering an entire year of total exclusiveness to the Dash community on its platform." Why should Dash pay for this ? 2.1 Aren't there already alternatives, that cost Dash nothing ? 2.2 Furthermore isn't Dash the most popular crypto in Venzualla, shouldn't other coins now pay instead for integrations instead of Dash ? How high are the fee's for buying Dash ? seeing if we are going to pay for it should be completely without fee. Selling Dash you could perhaps ask a fee. Q1:The legal limitations in Venezuela in terms of the operability of the exchange houses have made it difficult for us to place the platform on Livenet. However, the commitment to exclusivity for one year will get start once the platform is launched. Why it will be a year? Given the great potential and the plans that Cryptolifex has in mind, we do not would like to limit it, however the advertising to Dash by us will exceed that year and will be unique to Dash as a method of gratitude without requesting a budget from the DAO. Q2: Dash will be the only cryptocurrency in the platform for one year, the publicity we will do for the site will be tied to Dash. If they know Cryptolifex they will know about Dash, it is a win-win. Q2.2: Dash is the second most popular thanks to the work of Dash Venezuela, the most popular still remains BTC. The other cryptocurrencies do not have a great system like DAO, thanks to this great system we were able to start our project. Q3: The fees are for the people who post the announces (buy or sell Dash), now it is 1% (subject to change by the superintendency). The people that buy or sell directly from the announces will do so completely free. Lastly, there is a fee for withdrawing Dash from the platform which is 0.0002.
i'm not convinced that exchange specific costs like these mandatory licenses (which look similiar to the Bitlicense in the USA), should be funded through Dash budget system. I consider these more like operational costs for exchanges. Consider me Abstain for now, while i monitor the comments. However, i guess without any access to capital or loans, it will be quite difficult (if not outright impossible!) to build a working exchange that is self-sufficient while their initial turnover is not yet sufficient during the starting phase, in order to fully cover operational expenses on their own. Hi qwizzie, thank you for posting. We agree with you that the costs for the license should be covered as operational costs by the exchange but we have to consider that Cryptolifex is not in livenet yet and for that reason it does not have an income to support that kind of stuff. In other words no skin in the game, and if it all fails its okay the dao is here to help. You where funded you indicated your marketting budget for 12 months, this would take you until Janurary 2, 2019. Why are you making a new request for additional funding when you clearly indicated in your previous proposal you had the funds neccessary to start your exchange based on the information then? 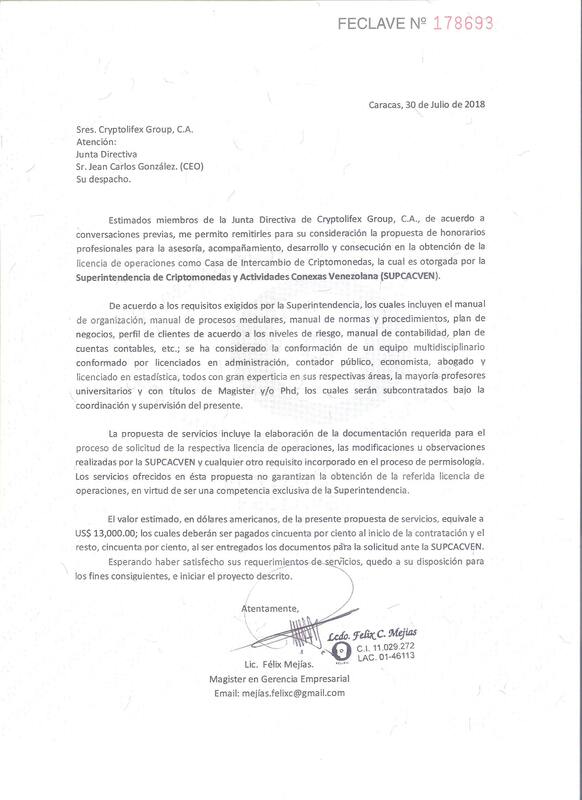 Thanks to the multidisciplinary team for their advice and support, the probability of obtaining the license increased considerably, which made us make a second proposal, since we do not have the necessary resources and do not lose the work done. The exchange is working and all the tests were carried out successfully, we left the exchange on the testnet since placing it on the livenet without the license will block the site and lead to legal sanctions. Making the change from Testnet to Livenet does not take more than 10 minutes. "Good real concerns regarding the comment on DC. Didn't know they are actually a returning proposal. Will follow this thread closely after all. Cheers and have a good day." I agree on above, still I want to see how this evolve. With a high probability of faolure and low roi. There is some concerns that pop up, your launching an exchange with absolutely no skin in the game. -Yes, 1 year. In Venezuela, especially in Caracas, the majority of the contracts to rent offices are like this: 1 year in advance, 3 months deposit and 1 month of fee for the person in charge. -Given that it is a sustainable business model, the first days without license will not generate any income, that's why we are requesting an amount of salary to pay the employees for the stipulated time of the license acquisition. -We have inverted more capital in this project that what you think. Just at the beginning of the first proposal, we had lost 60% approximately of the budget requested. -There are few known exchange houses in Venezuela, which makes Venezuelans use the most recognized exchanges internationally. -With good publicity and the expansion to various countries we can achieve a significative volume. Easy Yes on this one. Thank you very much for your support and good wishes. When reviewing the comments regarding our recent proposal, we consider it fundamental to offer a concrete response in the technical aspects, without forgetting to understand the value it represents for the DASH community, to locate ourselves in the foundation and postulates of the expansion that the community is looking for use DASH as a Digital currency. We are in a historical moment, especially from the financial and commercial point of view, what some have called a paradigmatic change. Like any change of paradigm, there is a conflict of interests and visions, especially in dogmatic and pragmatic positions, which is not new, nor archaic, but rather valid over time. The innovation of the Cryptocurrency nowadays implies a paradigmatic change for the modern world, in its social, commercial and financial dimensions; surely with the creation of the first cryptocurrency, the dogmatic conservatives and defenders of the fiat currencies, thought it was crazy, today it would be enough to see the growth of the cryptocurrency market in the world. As the philosopher of management, the Austrian Peter Druker, would say, "Where there is a successful company, someone once made a brave decision". Druker refers as brave the fact that it was a risk decision, as in any project, to get a profit you have to take risks, because who does not risk or win or lose. However, a risky decision does not imply improvisation, or a simple prestidigitation or illusion that what happens is what is desired. 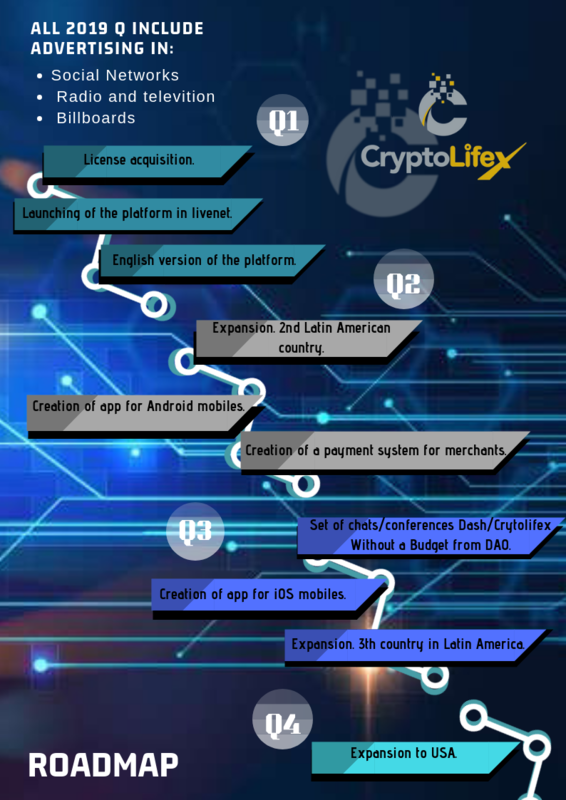 Cryptolifex, has formed a multidisciplinary team, as detailed in the proposal, the team, in a preliminary way has focused and helped us to infer the cryptocurrency market in Venezuela. In the twelfth conference of DASH Venezuela the indicators of the growth and perspectives of DASH in our country were shown, considering its exponential and dizzying expansion as a solution before the economic situation of the country. From the technical point of view, the growth of the monetary liquidity of the bolivar, and the control of change in the country, has promoted the Cryptocurrencies as escape valves to preserve personal and business finances. The volume that we expect to obtain in the operations within our platform, is determined by the added value that would represent, when obtaining the license of operations, for our clients, the power to legally and transparently register the personal and company operations, in its accounting, in a direct exchange between the Bs. and the DASH, which represents an advantage in relation to the international exchange houses. In relation to the cash flow and investments made, it is important to highlight that the expansion of the DASH is not only a new project, but that it is also a new economic area or sector, therefore the financial projections have high margins of errors in virtue that when valuing financial assets by methods such as the CAPM (Capital Asset Pricing Model) the Beta or risk rate to be applied, has no concise precedents that allow to reduce the margin of error in the projections, however, market expectations of Cryptocurrencies are extremely positive. Finally, regarding the comment that the DASH community should finance only the operational activities, to the detriment of covering licensing requirements, marketing, financial and strategic aspects, we believe that this is a one-dimensional view of the subject; the expansion that the DASH community wants and seeks in the world, does not depend exclusively on operational and technological factors, we believe that this strength is very solid in terms of the potential of the Cryptoactive market; the expansion of the DASH is a multidimensional or multifactorial issue, depends on factors beyond the technological, we believe that the social aspects of trade barriers, legal aspects, are the key factors to overcome in this world that is torn between passing or remaining in a point that has become a turning point for the future of trade and finance. Conclusive video and presentation, good job. I like the prospect of having a liquid Dash/VES market where Venezuelans can actively buy and sell Dash. Hello @Sergio87 a warm greeting. Excellent idea, to create a regulated exchange in Venezuela, we need it. Hello @RobbyDash a warm greeting. Good move to submit the proposal on the beginning of the new cycle @Cryptolifex. I'd like to see this proposal passing especially that it gives a real, licensed access for VZ to get Dash. @Alejandro @Eugenia, DashVenezuela & DashMerchants do you guys confirm the above? Hello splawik21 a warm greeting.